IBM has been a 'Dog of the Dow' for several years, and now it's the cheapest stock in the Dow 30. IBM (IBM - Get Report) has been a so-called "Dog of the Dow" for several years, and now it's the cheapest stock in the Dow Jones Industrial Average. The stock is starting 2019 with an 8.2x forward price-to-earnings ratio and a 5.5% dividend yield, which makes it well worth the risk to begin a position now. The tech giant closed 2018 at $113.67, down some 26% for the year and in bear-market territory -- 33.6% below its 2018 high of $171.13 set on Jan. 18. In fact, IBM has lost an astounding 47.4% since hitting a $215.90 all-time intraday high in March 2013. To me, that means the stock has become too cheap to ignore, and I'm apparently not the only one who feels that way. IBM, which has been a Dow Jones Industrial Average component since 1979, has actually rallied 7.3% since setting a multiyear low of $105.94 on Dec. 26. The company has also beaten analysts' earnings-per-share estimates for 16 consecutive quarters, although cautious guidance has hurt the stock's performance. Its AI applications are also based on the company's Watson platform, which needs to become more user-friendly. Still, I believe that the tech giant's use of state-of-the-art mainframe computers for its cloud-computing applications will eventually take market-share from cloud-computing competitors who rely on a farm of smaller servers. IBM is also attempting to be more competitive in data analysis, mobile technologies and security. This chart shows that IBM has been below a "death cross" since May 14. A "death cross" occurs when a stock's 50-day simple moving average falls below the 200-day simple moving average, indicating that lower prices lie ahead. Note how IBM couldn't hold its 200-day SMA of $150.15 on Oct. 5 and my quarterly pivot of $149.60 at the same time. This indicated risk to my semiannual and monthly pivots at $122.09 and $120.47, respectively. For this week, I show a weekly pivot at $110.30. 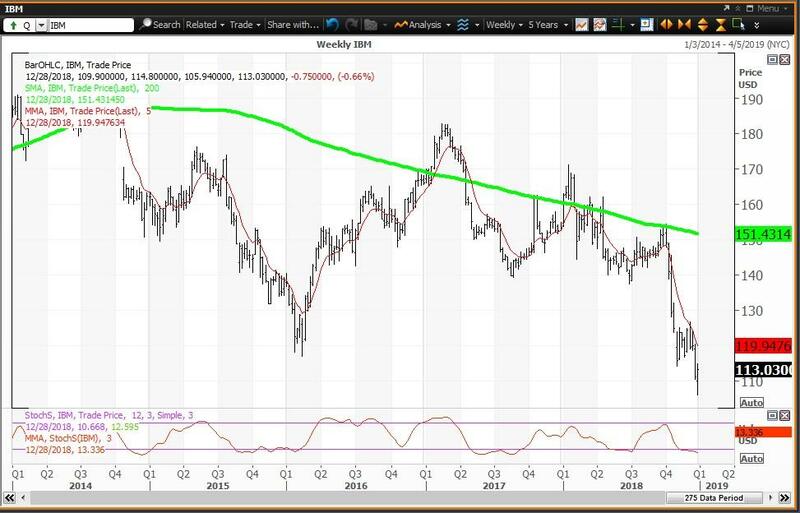 The weekly chart for IBM ended last week negative, but oversold. The stock finished the week below its five-week modified moving average of $119.95. IBM also ended well below its 200-week simple moving average (or "reversion to the mean") at $151.43 -- a level last tested during the week of Oct. 5, when the average was $153.66. Lastly, the 12x3x3 weekly slow-stochastic reading ended last week at 13.34, down from 14.67 on Dec. 21 and moving further below the oversold threshold of 20. 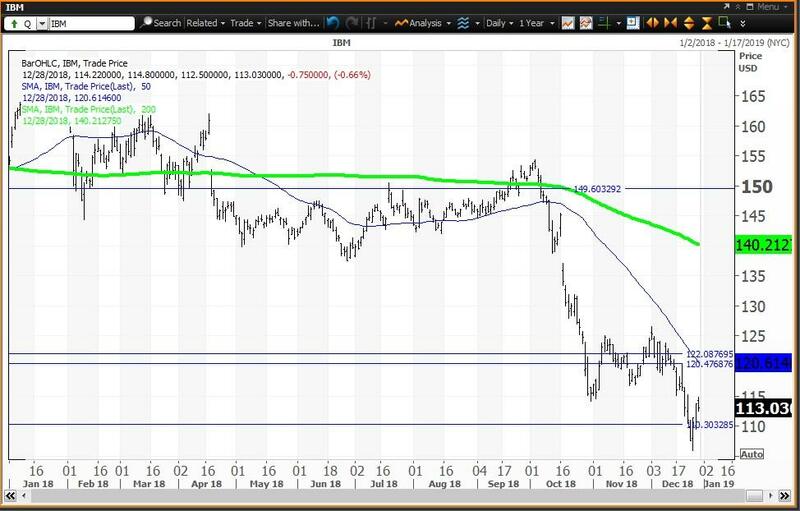 Given these charts and analysis, my trading strategy is to buy weakness to my weekly value level of $110.30 and reduce holdings on strength to my semiannual pivot of $122.09.